GM HARI OSIAS C. BANAAG, Ph.D./ Ma.D.Sc. Owner : BUKANG LIWAYWAY INTERNATIONAL SHIPPERS AND TRAVEL & Sikaran-ARNIS ACADEMY, ( SCHOOL OF PHILIPPINE MARTIAL ARTS.). 1995	-Sikaran Instructor, Angono National High School, Angono, Rizal. 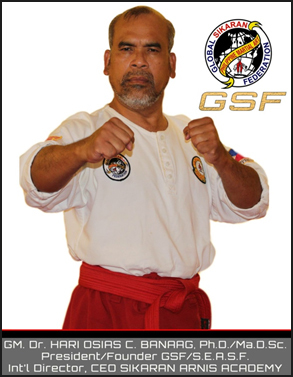 1997	- Owner / Proprietor – Sikaran – Arnis Academy, Delano California, U.S.A.
2004 Hall of Fame, “ The Sole King of Sikaran “ Los Angeles, California, U.S.A.
2005 Hall of Fame “ Achievement Awards “ Las Vegas, Nevada, Nevada, U.S.A.
2006 Hall of Fame “ Sikaran Grandmaster “ Los Angeles, California, U.S.A.
2008 Hall of Fame “ Doctorate of Martial Arts “ Los Angeles, California, U.S.A.
2011 Hall of Fame “ Leading Grandmaster / Outstanding Achievement Award “	Los Angeles, California, U.S.A.
2013 Hall of Fame “ Golden Life Award, Newport, California U.S.A.
2014 Hall of Fame “ Supreme International Grandmaster of the Year “San Diego, California, U.S.A.
2014Hall of Fame “ Elite Black belt Martial Arts Hall of Fame, Fresno California, U.S.A.
2017 Hall of Fame “Platinum Achievements Award “ Fullerton, California, U.S.A.
March 22 to 27, 1997 I was attended the World Martial Arts Convention for World Peace, In Washing DC., U.S.A. July 6 & 7, 2017 I Represent Philippines and United States for United Nation Education Scientific Organization (UNESCO) for Collective Consultation on the safeguarding and the Promotion of Tradition Sports and Games, In UNESCO Headquarters, Paris France. Since 1976 up to the present 41 years, I never stop Researching and Teaching Sikaran, I’m 50 years in Martial Arts Community, I started when 1968. I’m Hari Osias Catolos Banaag, I was born in Baras, Rizal (Where the Sikaran was Originated), My Birthday February 4, 1959, I’m the 3rd Sons of Jeremias De Guzman Banaag and Maria Catolos Banaag, where 6 Siblings, 5 boys and 1 youngest Sister and also one adopter Sister. My Oldest Brother is Evenizer C. Banaag, 2nd Joel C. Banaag, I’m the 3rd one, 4th Manuel C. Banaag and Youngest brother is Jonathan C. Banaag and youngest Sister Evangeline C. Banaag, our Adopted Sister Maricel S. Catolos.